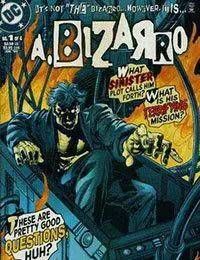 A. Bizarro is the title of a four-issue comic book limited series published by DC Comics in 1999, and the name of the lead character of that series. The creators included writer Steve Gerber, penciller M. D. Bright, inker Greg Adams, colorist Tom Ziuko with separations by Digital Chameleon, letterer Steve Dutro, and editor Joey Cavalieri. It features characters from the Superman family of titles.